Beautiful Dahab – I Arrived in Sinai. I have arrived in Sinai. The bus ride was long, although Sinai is a lovely, beautiful place. I had to connect buses in Sharm El-Sheikh – I have no interest in going to Sharm, what a rip off of a place. 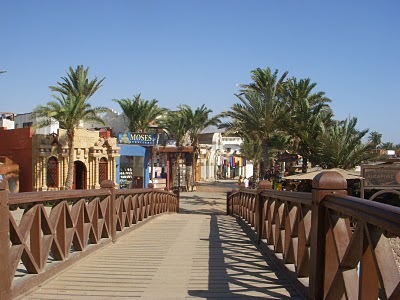 I will be in Dahab for a least two weeks, which I will be house sitting for a week through CouchSurfing.com. From Dahab I will be going to Mount Sinai, I don’t know how long I will be there, most likely for a week or longer. I will be looking to arrange a desert safari into the Sinai Desert on camel at some point in time before I leave Sinai. Dahab is a relaxed small area with excellent diving, snorkelling, and other water sports, although the town of Dahab is very touristic. It is also one of the most popular places to get certified for diving. I personally don’t have much of an interest in diving. I lived out in Hawaii for two years and didn’t find any interest in diving, although I do love to snorkel. I would rather spend the money on a desert safari instead of diving. 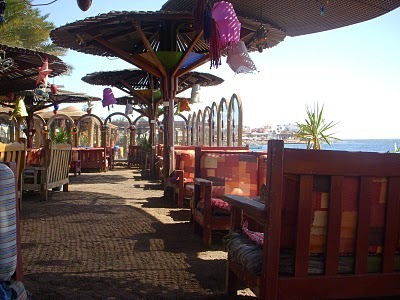 For the most part, Dahab is more expensive than most parts of Egypt expect for Sharm El-Sheikh and Hurghada, although the accommodation is a good deal – I am only paying 30LE a night which the hotel is a wonderful, kickback place, with Bedouin style sitting areas. It looks like I will start house-sitting on the 26th. Throughly traveling Egypt was an experience, I am referring to west of the Red Sea and the Suez Canal. Visiting Ismallia put the icing on the cake. The town has a couple of nice grassy squares where a person can sit and have some tea. Surprisingly enough they gave me the tea for free. Everyone, including the taxis men were very honest. In Egypt, when men or women meet a close friend in the street or wherever, they will kiss each other on each cheek. Keep in mind this has nothing do to with homo-sexuality, just normal greetings and goodbyes within their culture. My dancing must have opened many hearts because it was the only place in Egypt that several men kiss me on each cheek goodbye. Certainly something that is new to me, although I do find that this type of farewell is healthy. Something else happened while I in Ismallia. I was walking down the main street of the town and stopped to buy a bottle of water. A store owner, in the next store, who sells paintings and such type of artwork invited me in to visit, although he did say he was not going to try to sell me anything. We ended up visiting for a good hour and a half. Because of the time I gave him, he gave me a beautiful panting, small enough to carry under my arm. What a surprise. I have always insisted for people not to give me anything because then I have to carry it. Nevertheless, this time the energy pointed to accepting it and bringing it to Dahab. Why a person may ask? I will explain this at a latter date. 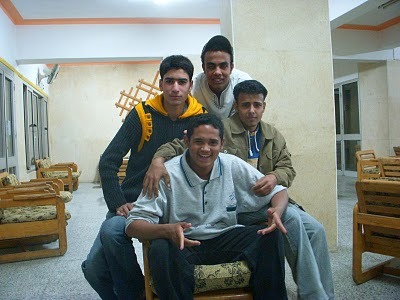 A few of the collage guys at the hostel in Ismallia. Ismallia: certainly not a touristic town, Indeed the Lonely Planet only gives the town two pages in their 572 guide page book; a town that might not even make it on the map; a town which you never hear of when talking about Egypt; it’s a town that I will never forget, and – If and when I visit Egypt again it will be one of the first towns I will return to. 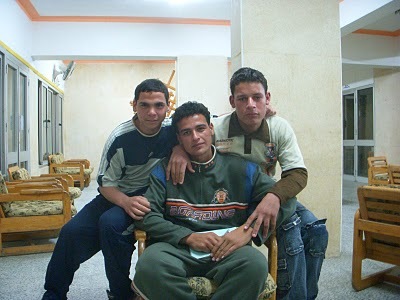 Outside of Sinai – the best was saved for the last, but certainly not the least. 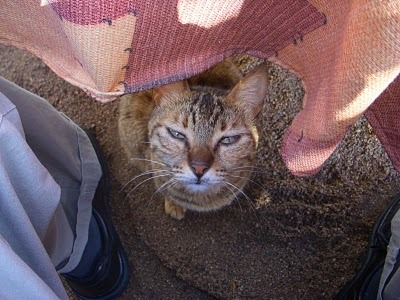 This cat was dying for some of my breakfast, as you can tell. I did have an idea of throwing him into the sea of Aqaba and watching how stupid he would look swimming to the shore, although my soft heart got the better of me and I slipped a nice meaty treat. 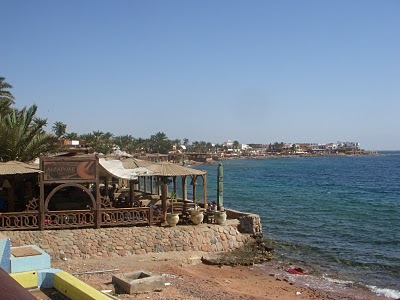 Next post: The Sea of Aqaba – Dahab. Previous post: Ismaillia – Off the Beaten Path.